on Miss Abigail to have her calf! “All in due time,” says she. She isn’t due until November 16th, but … we are on active watch now. Her belly is hard as a basketball, pumped a little too full of air. I check her before I go to bed … and again during the night. Last night, I tried to leave a light on in the barn and use the zoom lens on my camera to check her from my bedroom window. But, Miss Abigail chose to rest in a spot in the barn where I couldn’t see her. Sigh. After going outside, I have trouble getting back to sleep. When the boys were little and had trouble returning to sleep, I used to tell them to think happy-thoughts until they drifted back to sleep. The night before, I laid there thinking of what goodies I could try dipping in melted almond bark for Christmas candy. I think I gained five pounds, just thinking about it. Maybe pig-farmer will check her when he returns home from work-travels tomorrow night. Stay tuned and wait with me, my friends? 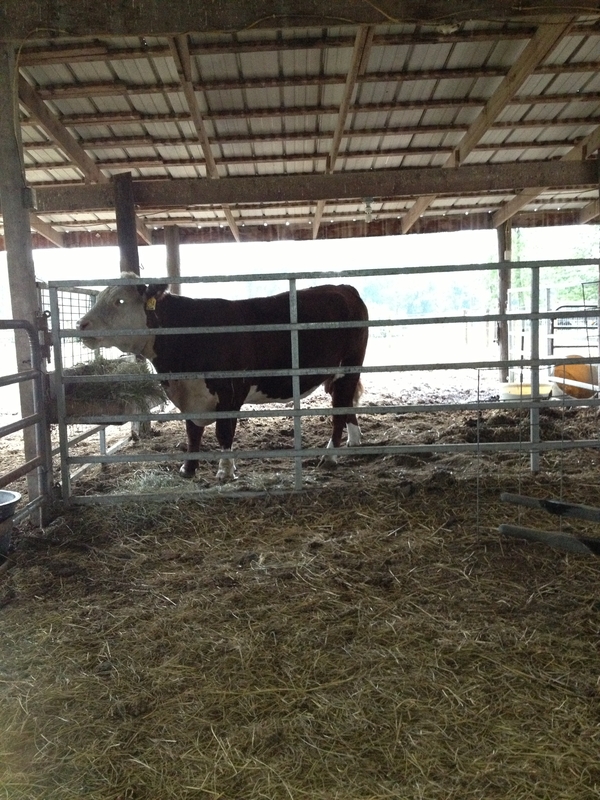 This entry was posted in Country Living and tagged calving, country living, Polled Hereford, Waiting. Bookmark the permalink. Can’t wait to see her new baby! Now lissen, Marla dear, I don’t know nuthin’ ’bout birthin’ no baby cows. You on your own for that adventure. Pig Farmer better stay home and wait with you. I hope Mother Nature does her job without any assistance needed!